I too have the cox racing rad guards and did not notice an increase in temp at all. This bike does get hot in bumper to bumper traffic and then cools right down once moving at speed. My dealership recommended them and will not have any issues with warranty. These radiators are not cheap and a rock to the rad would be catastrophic..and I'm not sure if a rock to a radiator is covered under warranty as it is more of a road hazard/ the riders fault. Rad guards are cheap insurance this does not happen. My dealer also recommended them as a must have. He also recommended not fitting the Dynamic pro plug as he said it was designed only to work with Slick tyres fitted. As he is also one of the top men in Pirelli tyres BSB team I'm quessing he knows what he's talking about. I'm guessing not he needs to RTFM. The DYNAMIC PRO mode cannot be activated unless the coding plug is inserted. The DYNAMIC PRO mode was developed for situations in which the rider has an open view of the road ahead and the surroundings and is riding on surfaces with the high level of grip generally encountered only on racetracks. Similarly, the assumption on which the parameter settings for this mode are based is that the motorcycle is fitted with tyres with a very high level of surface grip. The behaviour of the ABS is the same as in DYNAMIC mode, with one exception: ABS control is not active at the rear wheel when the footbrake lever is pressed. Under these circumstances, the rear wheel can lock up. The function for detecting the rear wheel's tendency to lift clear of the ground is also deactivated." Calm down dude, seems he's pretty much on the money. May be why dealers won't fit it? Or could be he got the idea from slick mode on the rr and has never read the manual for the r and doesn't know what he is talking about. They are different motors and bikes after all. Nope don't think so. The excerpt in my post is from the S1KR manual. I'm supposing you have read it? The motors are different, our engines produce more power and torque where it matters!! Put the plug in you'll be fine. As for it being designed to only be used with slick tyres that doesn't make any sense to me. So does that apply to every other litre sports bike (around the 160 bhp) that doesn't have rider aids?? 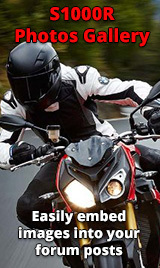 You'd have to be completely disconnected from the bike (throttle to rear tyre or a numskull) to keep rolling on without feeling the rear tyre is losing grip.